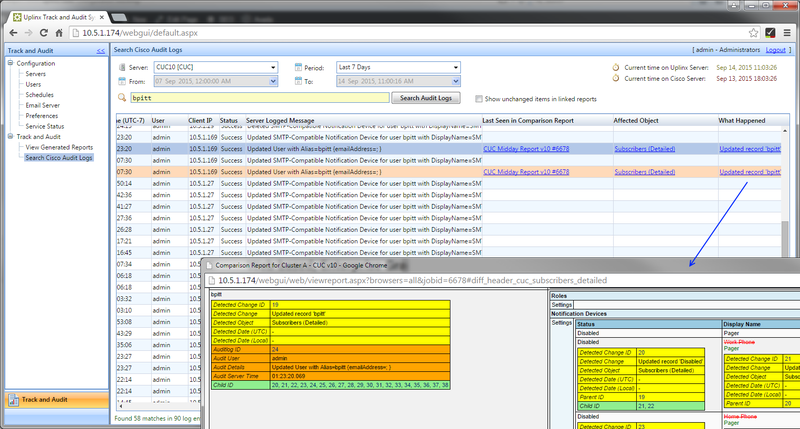 UPLINX Track & Audit makes it easy to search Cisco Audit Logs and quickly identify all affected configurations. The web-based Audit Log console enables you to track all affected configurations which contain the entered keyword and match the search filter. Enter any keyword and UPLINX Track & Audit will analyze the Cisco Audit Logs and find any matches, analyze the change and display any affected configurations with links to the comparison-audit reports. Clicking on any of the identified items will navigate to the configuration change of the Cisco Unified Communications server, which shows the time, change details and user making the change. 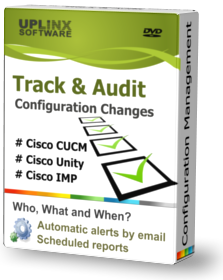 The Track & Audit server automatically collects Cisco Audit Logs from the Cisco CUCM, CUC or IMP server. When configuration changes are found, email alerts to systems administrators can be triggered.